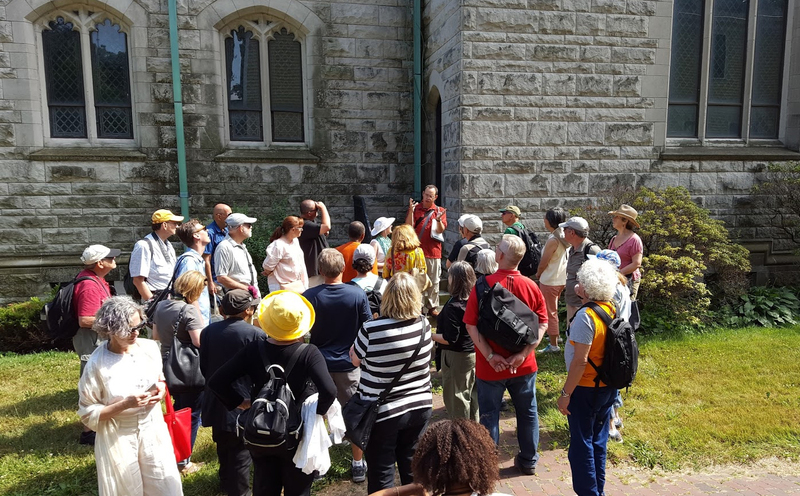 For the ultimate deep-dive into the history of New York’s greatest public park, take the Secrets of Governors Island Walking Tour led by Kevin C. Fitzpatrick, author of The Governors Island Explorer’s Guide. This is the first and only guide book for the Island; it was nominated by the Guides Association for New York City for the Apple Award for Outstanding Achievement in Non-Fiction New York Books. Kevin, a licensed New York City sightseeing guide, started leading this walking tour in 2006. Besides the fine National Park Service rangers, he has given more tours than any other guide on the Island, for 13 years. Private charters are also available if you contact him. There are other tours of the Island, but this is the only one that is two hours in length and covers both city and federal landmarks, visits Fort Jay and Castle Williams, and shows visitors the secret spots. Hear some dark secrets and see where the bodies are (literally) buried. For more than 200 years, Governors Island was closed to the public. Learn how a former military post became New York’s greatest new park. This tour is for anyone who wants to learn about the island’s past, present, and future. It’s an active walking tour of pathways and hills, of approximately three miles. The island is only accessible by a seven-minute ferry ride; your ferry ticket is included in the cost of your tour. * See rare photos, maps, and drawings from Kevin’s personal collection. Tickets must be bought at least 2 hours in advance of the tour start time. The Guide: Your guide will have a BLUE flag. The meeting time is always at least 30 minutes before the schedule start time. If it is a 2:00 p.m. tour, meet 1:30-1:45 p.m. inside the lobby of the Battery Maritime Building. The cost of your ticket is included with advance purchase. Arrive at the ferry terminal at least 30 minutes before departure time. The ferry departs promptly, do not miss the boat. Where do I get on the ferry? Manhattan at the Battery Maritime Building, 10 South Street (next door to the Staten Island Ferry Terminal). The cost of the ticket is included in the tour. * Extra cash, as there are food and beverages available for purchase on the Island. There is an ATM, but it sometimes runs out of money! Yes. If they are open to the public the day we are on the tour. We will go inside the Commanding General’s Quarters, Castle Williams, and Fort Jay. Touring other buildings depends if they are open to the public (schedule determined by the Island). The visits are for limited amounts of time determined by your guide. You can always return to explore what catches your attention afterwards. Note: Tours of the interior and parapet of Castle Williams are only given by the National Park Service. If you want to take the ferry from Brooklyn, and meet the guide on the Island, you must contact him a day in advance to get alternate meeting location on Governors Island. This is not a problem at all. See above, to meet the guide on the Island, you must contact him a day in advance to get alternate meeting location on Governors Island. This is not a problem at all. The tour does not start and end at the same place. Your tour guide will be more than happy to give directions to the ferry dock or point you in the right direction for your next destination. Yes. Restrooms are available at the meeting location. There are also restrooms along the route. No dogs are allowed on Governors Island, except service dogs with proper papers.